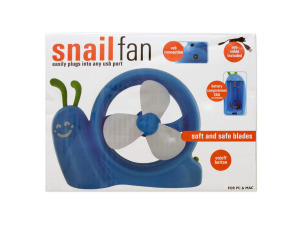 Great for kids, this cute 2.5 Watt Battery Operated Snail USB Fan has soft and safe blades and an on/off button. Measures approximately 5.25" x 7" x 2". Easily plugs into any USB port; USB cable included. Requires 3 'AA' batteries (not included). Comes packaged in an individual box. Box measures approximately 7" x 5.25" x 2.75".